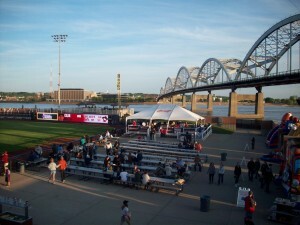 Ballpark Basics: A park surrounded by a scenic backdrop, mighty river and multiple cities worth of a friendly fan base. The Quad cities, as name suggests, are a group of towns nestled together bridging the border between Illinois and Iowa. 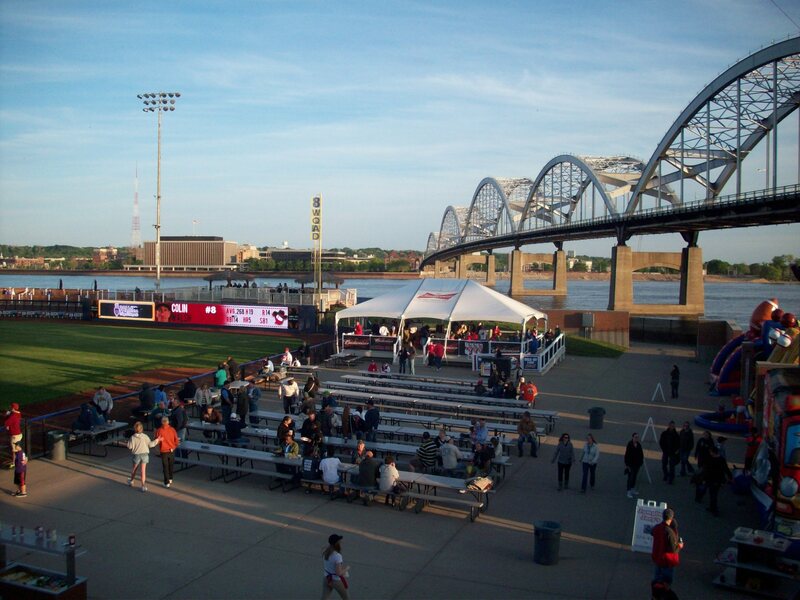 The Riverdogs draw fans from the whole area and therefore carry that moniker as well, although Modern Woodmen Park is specifically located in one of the two cities on the Iowa side, Davenport. After talking to some of the local patrons at Great River Brewery (see below) we were excited to finally get inside the park as each person raved about the views. 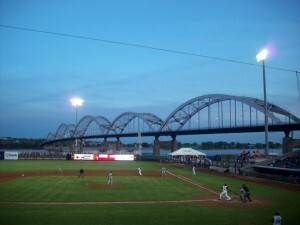 The ballpark is easily located in downtown Davenport and is an easy walk from many of the local bars and restaurants. They charge two dollars for parking but you receive two dollars in Bandit Bucks towards any purchase in the stadium. If you do not want to deal with this there is plenty of off street parking around the ballpark. Walking up to the ballpark it seems fairly nondescript. A large white wall surrounds the ballpark and blends into the original facade in the front. Curved cutouts house the ticket booth, team offices and finally the steps up to the concourse. Once you climb the stairs to the concourse however, the ballpark opens up to one of the best views in all of the baseball. The Midwest League is known for many of its beautiful ballparks and Modern Woodmen Park is right up there with the best of them. The ballpark you see today looks very little like the one that opened as Municipal Stadium on the banks of the Mississippi River in 1931. 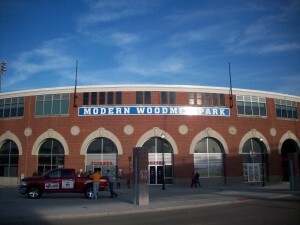 In 1971 it was renamed John O’Donnell Stadium to honor a local sports editor, and finally it became Modern Woodmen in 2007, after the Modern Woodmen of America bought the naming rights. As for renovations, the park went through some updating in 1989, but the big changes came before the 2004 season. That’s when it went through a major overhaul including the addition of 20 luxury suites, home and road clubhouses, batting cages, new team stores, a new restaurant and a new scoreboard. Most importantly was the addition of a new grass berm in the outfield. Not only does this provide lawn seating for fans in the outfield but it also acts as a flood-wall to protect the ballpark from the Mississippi. Aside from providing stunning views and the threat of flooding, the Mississippi has another effect on the ballpark; the bugs. The amount of bugs you encounter when walking the outfield concourse can make you question whether the rapture is coming. Even very early in the still cool Midwest spring, there were a few spots along the concourse when you held your breath, covered your concessions, and picked up the pace. However, they don’t seem to be much of a problem along the main seating area. The best seats in the house are down the third base line since this allows you a perfect view of the field as well as the Mississippi River and the gorgeous Centennial Bridge that spans the river. We recommend catching an evening game if you can because the view is worth catching both in daylight and after the sun sets. We were lucky enough to catch a Thirst-day game. 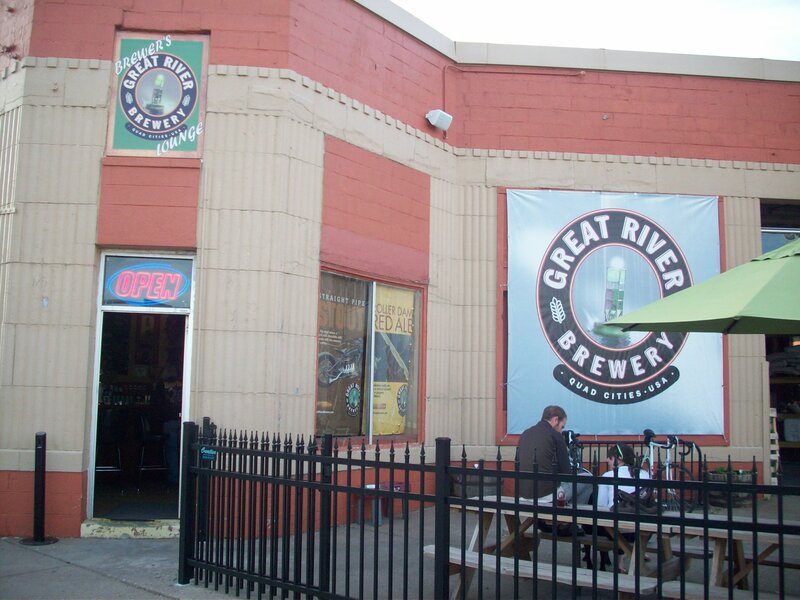 All draft beers cost two dollars including the local brews from Great River Brewery (one of our new favorites!). 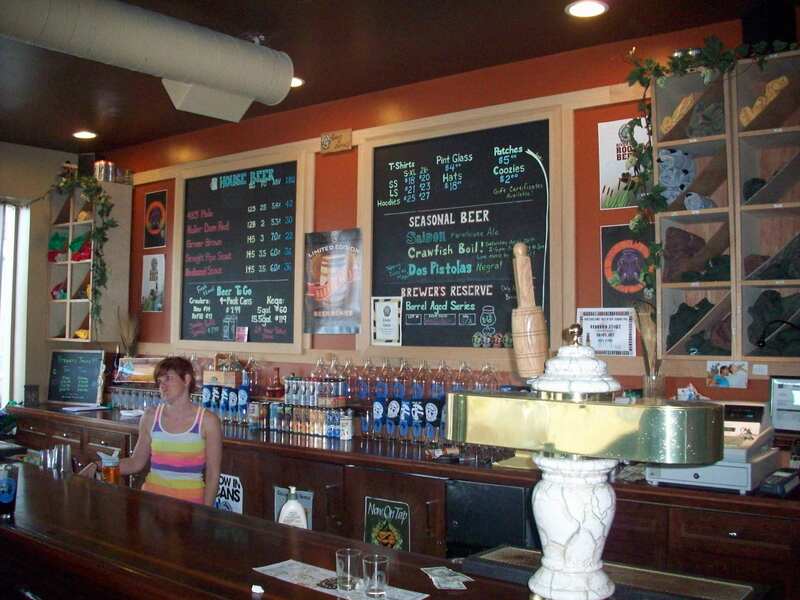 Other than Great River, however, your options are fairly limited if you are looking for a local craft beer. Some of the other options include Woodchuck and Shock Top (on top of the usual suspects). This is probably our only complaint the entire night. With multiple local breweries within the Quad Cities it would be nice to see them expand their beer list. From the main concourse you can take a set of steps down to a huge party area down the right field line with a covered patio and picnic tables as well as inflatable games for the little ones. It has one of the best integrations of a kid’s area with the game that we have seen. Parents can easily sit at one of the numerous picnic tables while keeping one eye on their kids and one eye on the game. They even rent out the area for parties without restricting it from all the other fans. They simply have wristbands for the people that are attending the function. Another great idea that allows everyone to enjoy this area. One more interesting aspect worth noting is the corn field down the left field line, which was planted in 2008. When the corn reaches its full height in summer, the Quad Cities players are announced as they walk out of the corn field as a nod to Field of Dreams. Only in Iowa! We were excited to catch a game here. After seeing pictures online we knew it had one of the best backdrops in the minors. The ballpark did not disappoint and is even more gorgeous in person. Partner that with the fact that is placed in the middle of downtown Davenport and walking distance to one of our favorite new breweries and it turned out to be a great night. If you are in the area we definitely recommend taking in a game. It will be well worth your time. Brew Basics: When the bridge opens, run for the brewery! 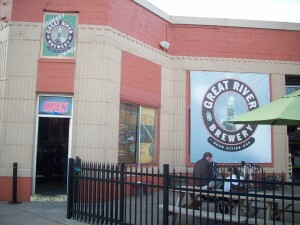 As mentioned, the Quad Cities area Great River Brewery calls home are divided between Iowa and Illinois (while the area is part of four counties, there are actually five cities in the Quad Cities – Davenport and Bettendorf are on the Iowa side, while Rock Island, Moline and East Moline are within Illinois state lines). Great River itself if located on the Iowa side right by a large bridge that spans the Mississippi River; important to note because when the bridge opens to allow large ships to pass, all beers are half priced. This is an awesome deal that is quite a draw for the locals. We even talked to two residents who grab their dog* and start running every time they hear the alarm signifying the bridge opening so they don’t miss a second of the special. It helps that they live just up the hill. *Sidenote: dogs are welcome inside and out of Great River; it’s just that kind of easy going place. It was fun having them around…although that did make us feel a bit guilty that our dog was several hundred miles away in a kennel. Founded in 2004 in an Iowa City brew pub, today their wares are available for purchase in at least seven states. The current Davenport location opened in 2008 and boasts a large porch area with picnic tables and umbrellas which would be a great space to hang out on a nice summer day. Unfortunately for us, it was a chilly, rainy spring evening when we visited – so we headed inside. Upon entering you are greeted with just a couple tables to the right, doors and windows exposing the brew works dead ahead, and an L shaped bar to the left. Two chalkboards behind the bar let you know what’s available and the typical merchandise (growlers, t-shirts, coozies and glasses) line the bar area. They also started canning in 2010, so there are all kinds, chilled and ready to take to-go. The bartender Kat was also highly knowledgeable and willing to find out the answers to any questions we asked. In fact, everyone we encountered was friendly (which is good, seeing as Great River doesn’t have any tv’s to promote conversation) and welcoming with lots of suggestions as to what we should try and which was actually the best beer Great River had to offer. They seemed divided on that though, which we understood as soon as we dived into the flight. River Rat Root Beer (N/A ABV and IBU) – The proceeds from this one go to Living Lands and Waters, a group that works on all things environmental, with a specific focus on river clean up. And it is the founder of the organization, Chad Pregracke, for whom the beer is named. The River Rat uses only cane sugar in the recipe instead of the more common corn sweeteners. It was just as dark in color as one of the stouts, had a great tangy root beer aroma and was smooth going down. Not being professional root beer drinkers ourselves, we can only suggest you go out, buy yourself a couple of cans, all while contributing to help save the earth. Not bad for a thirst quencher. Saison Farmhouse Ale (4.5 ABV) Always a popular warm weather option, this saison does not disappoint. It has a coppery peach color, smells wheaty and tastes a bit dry. As a saison, there is a slightly sweet palate but it is more honeyed than the banana notes of many unfiltered beers. Great River has added an atypical ingredient to this one – ground black pepper. This combines with the traditional saison sweetness for dry, slightly tangy flavor, but the pepper is actually most notable in the finish which leaves a dry sparkle on your tongue. 483 Pale Ale (5.4 ABV 48 IBU) – As your momma always said, “Don’t judge a book by it’s cover.” The 483 is an American style pale ale (APA) that smells dry and of the hops and rye grain, which give it an unexpectedly sour smell for a beer that one could assume would have a floral or fruity aroma based on the beer style and color; which is a more golden hued peach than that of the saison above. The sour smell does not carry over into the taste, which is actually quite mild and not very carbonated. is also a bit more diluted – not as saturated than the first two as well. On your tongue, the Roller Dam starts mild and builds to a spicy punch that peaks and then subsides in the swallow. Organic Farmer Brown (6.2 ABV, 22 IBU) This nut brown has such a deep chocolate color that you have to be careful not to set it down next to one of the stouts as you may have trouble differentiating which is which based on sight alone. Although it does not appear terribly carbonated, it is surprisingly tingly as you take a drink. The robust flavor begins with a sweet brown sugar takes a slow slide down the throat, giving way t a true roasted nut taste. Espresso Stout (6.0 ABV, 36 IBU) Great River starts with cold pressed Redband coffee and infuse it into their Straight Pipe recipe. It actually smells exactly like freshly used coffee grounds, not the usual coffee aroma characteristic of certain types of roasted malts. Continuing with the theme, the dark color is the shade of a full pot of coffee, and the taste is reminiscent of coffee liquor. All around delicious, it’ll make you remember why you’re a coffee lover. Vanilla Bean Barrel Aged Brewers Reserve Series – This is one of their limited reserve series, so we were lucky to grab a glass. Dark brown color with a hint of head, it gives off a good homemade smell, like that of vanilla extract and sugar and maybe a hint of rye toward the end of the smell. Likewise, most of the flavor is in the aftertaste, or at least toward the end of the sip. Sweet then rye palate that would probably be fairly amazing paired with some vanilla ice cream, Root Beer Float style. Dangerous when you combine the high drinkability with the high gravity.